U.S. President Donald Trump said he welcomed the two Korea's agreement on denuclearizing the Korean Peninsula and their move towards ending war, Seoul's presidential office said Sunday. 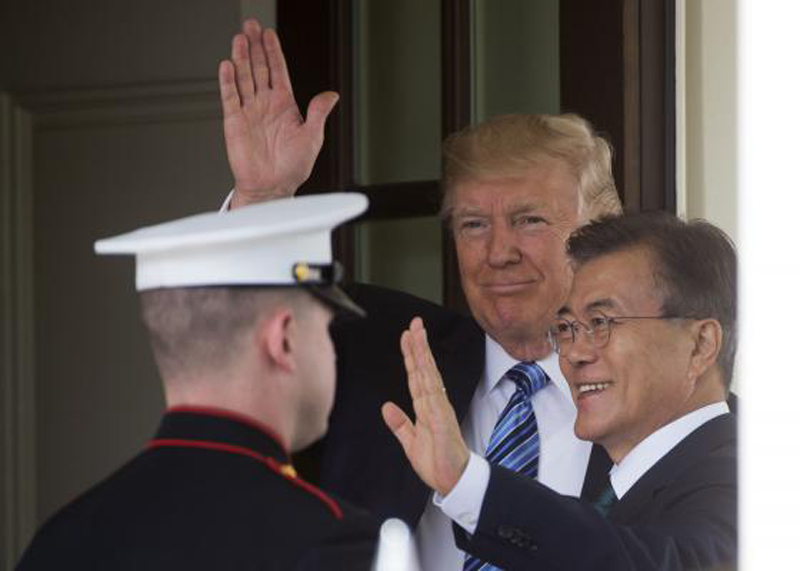 Trump and South Korean President Moon Jae-in reportedly spoke for 75 minutes on the phone, from around 9:15 a.m. Saturday, Seoul time, the morning after the inter-Korean summit Friday, Hankook Ilbo reported. The U.S. president reportedly said the South and North's Panmunjom Declaration was very welcome news for the world, not just the two Koreas, and expressed support for the move to formally end the 1950-53 Korean war which was ended with a ceasefire. Moon and Trump are also said to have discussed two to three locations as possible venues for the upcoming U.S.-North Korea summit, which Trump initially said would happen in late-May or early June. The U.S. President said Saturday at a rally in Michigan that he is likely to meet Kim in the next three or four weeks. He said he hoped for successful negotiations on denuclearizing the Korean Peninsula but, once again, added he is ready to walk away if the talks don't go well. The U.S. has reportedly shortlisted the possible venues to two or three neutral locations which are rumoured to include Singapore and Ulaanbaatar, Mongolia. Seoul officials said they couldn't reveal which venue Moon had recommended but hinted Washington may announce the time and place sooner than expected. Moon and Trump's conversation on Saturday marked their longest ever phone call since their hour-long talks on December 1, after the North tested a new intercontinental ballistic missile (ICBM) and claimed it had completed its "nuclear force," Sisa Journal reported. The two leaders are expected to meet in the coming weeks, for a summit, before Trump sits down with Kim Jong Un.